Many have been eagerly waiting for this moment and we can now finally proudly announce: InLoox 10 is here! What does the new version have to offer? Read - or test - for yourself. We know: Your daily work routine is already complex enough. That is why we have integrated and adapted InLoox 10 even more strongly into your existing systems. 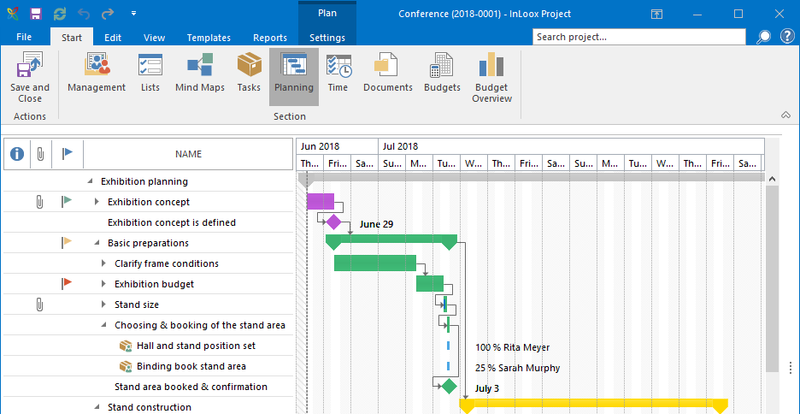 With the convenient login for Oﬃce 365 users, the fast booking of Outlook elements and the simple connection to SharePoint, SharePoint Online and 2016 or OneDrive, you are connected to all applications that you need for efficient project work. The more dynamic the work environment, the more important it is to have a project management software that supports you in every situation. 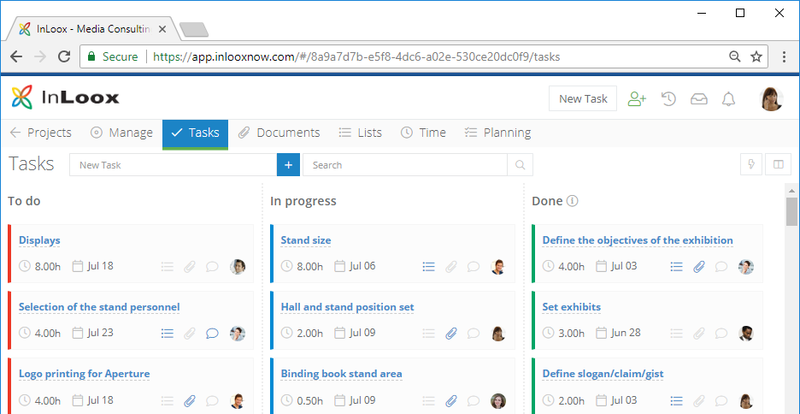 With InLoox 10, your tasks, project data and status overviews are always at hand and reliably accessible - thanks to the new offline availability for InLoox PM and for InLoox now! With InLoox you are now completely flexible and can work on your projects from anywhere. The data is automatically updated as soon as InLoox has established a connection to the project database again. InLoox now! 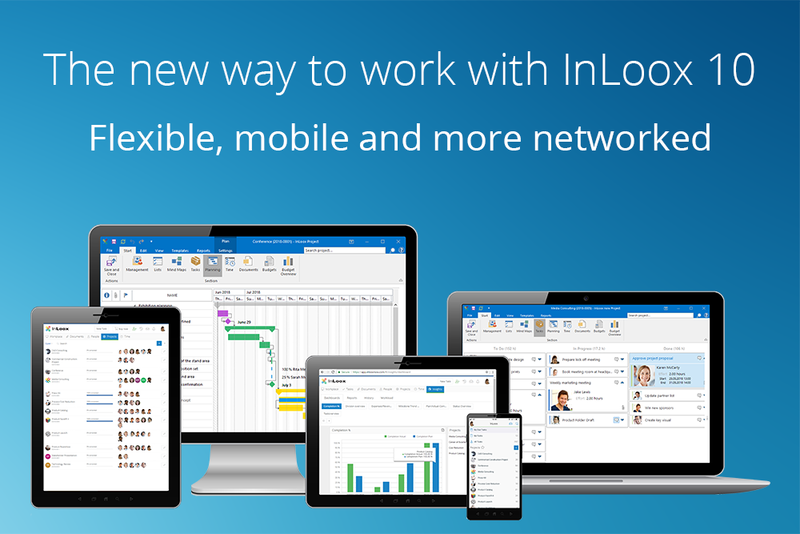 users with a Microsoft Oﬃce 365 account log on to InLoox now! with just one click and the same authentication. This saves time and supports you in linking InLoox now! to your other Microsoft applications. Until now, emails could be saved directly via the Outlook ribbon in InLoox. We have now taken this one step further: The new one-click feature allows you to save an e-mail as a task or document in a project directly in the e-mail preview window - with just a single click. You can also use the one-click feature to create a new project from an e-mail. Users have often asked us for this feature and we have now implemented it with the one-click feature. 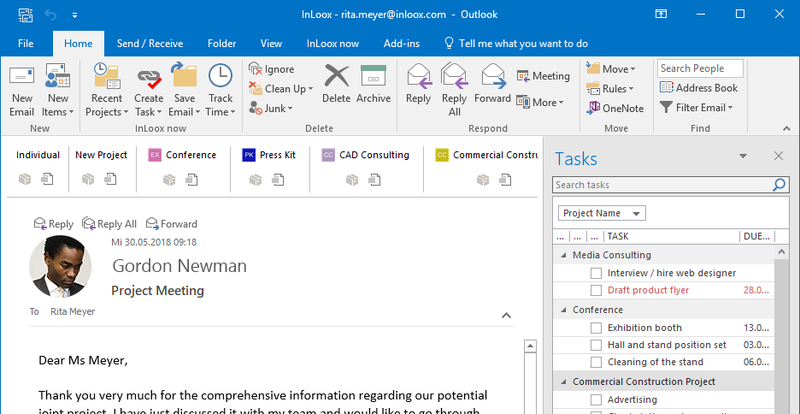 InLoox 10 has been given a more modern design and now blends even more seamlessly into Outlook 2016. 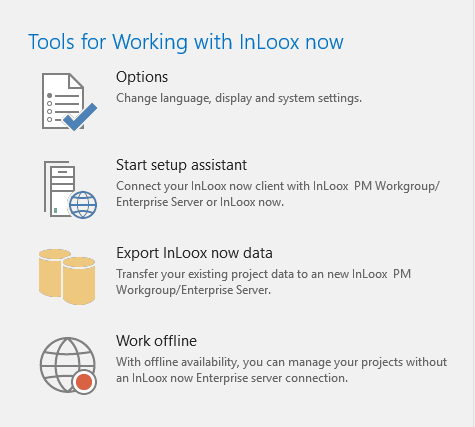 This allows new users to work in the familiar Outlook user interface and makes it much easier to get started with InLoox. We’ve also re-designed InLoox Web App: the user interface is flatter and more modern. One thing stays the same: It’s still easy to use. We have made your document management even more convenient. With InLoox 10 you can integrate Microsoft SharePoint 2016 or SharePoint Online as well as Microsoft OneDrive for Business. The big advantage: You can display your existing document structure directly in InLoox. As soon as documents or folders are updated, InLoox synchronizes the changes. You can now also link documents, such as contracts or quotations, directly to budgets or budget items. In this way you can establish a better reference for settlements and the time-consuming search and inquiries of the bookkeeping has an end. You have created a collection of inspiration for the relaunch of your website? Or stored several online articles for your market analysis? Then store the Internet links in the document area of your project. 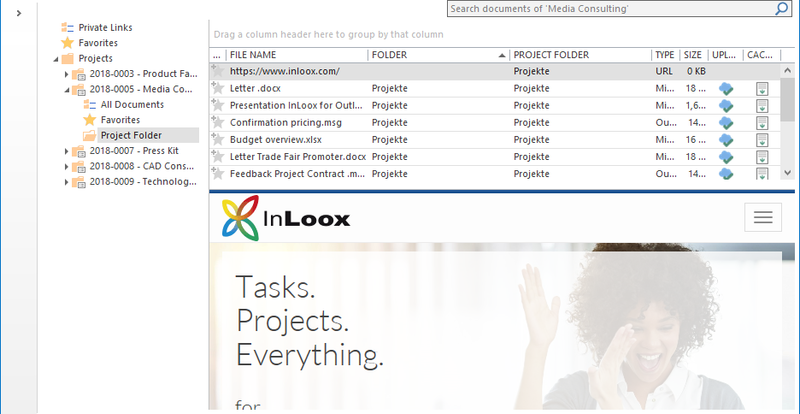 Scroll and navigate through the web pages in the document preview window without having to leave InLoox for Outlook. 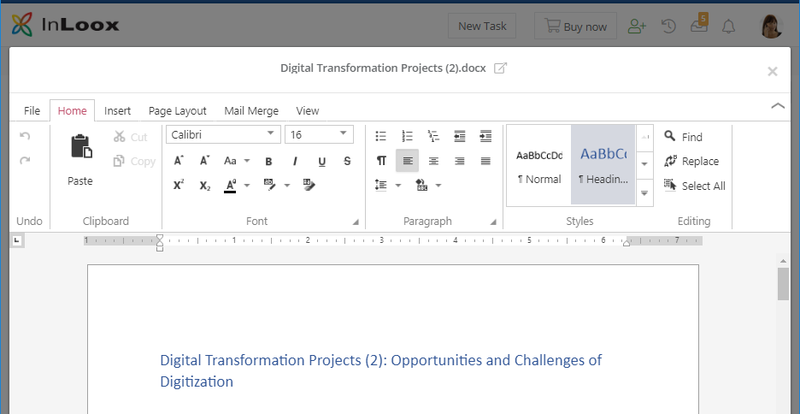 InLoox Web App users no longer need to download and upload project documents for editing, but can now edit and save Word or Excel files directly in their browser. Data control and security are extremely important. With InLoox 10 you can now create your own backup of your Inloox PM or Inloox now! database. This gives you full control over the security of your data and allows you to act independently of the availability of the InLoox support. Until now, InLoox PM users could simply switch to InLoox now!. Unfortunately, the other way around was not possible. InLoox now! users can now easily switch to InLoox PM in Version 10. Best of all, you can also migrate your documents stored in InLoox and do not have to link them to your InLoox elements again. The New Way to Work with InLoox 10: Flexible, Mobile & More Networked - InLoox • Copyright 1999-2019 © InLoox, Inc. All rights reserved.